It’s time for another award and i want to thank all my followers and the people who supports me all the time to grow my blog! 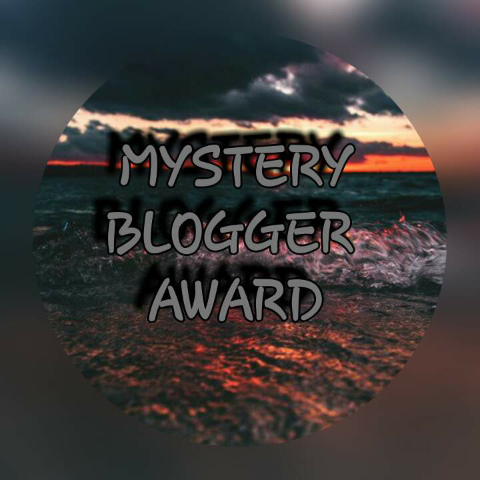 I would like to thanks Prachi for nominating me for “The Mystery Blogger Award”. Prachi has a great blog with amazing writings and she is one of the kind and friendly blogger.I feel quite honoured and happy to accept this award! Do visit her blog which has amazing writings and you will like it for sure! Thanks to Okoto Enigma for creating the award! This is a nice way to connect with more people. Click here to know about this award!Do visit her blog which has creative Writings! 1⃣ I’m a selfie freak and i take lot of photos atleast one a day. 2⃣ I’m a foodie, i eat a lot and i love roaming out ,i can roam out all the day with my favourite people. 3⃣ I don’t like watching cricket and not a fan of TV. I never feel bored of something or someone.I can spend whole day all alone without anyone just with my phone or with any book. Many things on earth would start floating like this and there would be no oceans and rivers! Dogs,lizards,snakes and leaving some people whom i love the most! 3. What are you addicted to? Coffee ☕,mmmm…i just love coffee. I can simply say that me and coffee are born for each other!chocolates..…the sweetest things in the whole world..i always have the fantasy and dream of swimming in a Chocolate pool😂I can’t imagine spending a day without my mobile even! 4. How does blogging help you? Good question! I never had the idea of blogging before but once i started i found great blogs here and met great people.So blogging helps me to know new things ,gain knowledge and get in-depth knowledge and improves the quality of my language.I met such a great mothers, students, writers, single parents, emplyees, retired one’s, happily married and single one’s who blogs with great passion and effort inspite of their busy schedule! Defenitely Love.I can survive without monry but i can’t live without love! Money is just a part and necessary thing to live but Love it’s a magical word to live in a magical world!! Do visit these blogs and you can surely have great fun and inspiring thoughts! 1.How many times a day do you look at yourself in the mirror? 2. What is your greatest strength and weakness? 4. Name three things in nature you find most beautiful! 5. What’s your profession and why did you choose this ?have you choose this on your own or you have to by fate? There is no complusion to accept this award ,but if you do it,i will be glad and happy to read your answers!